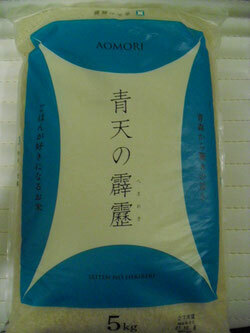 A new rice product came to market simultaneously in Aomori Pref. on 10 October, 2015. For the first time in Aomori Pref., "Seiten no Hekireki" obtained Special A level in Rice Taste Ranking of Japan Grain Inspection Association last year. My friend in Hachinohe, Aomori sent me this up-and-coming rice on the date of debut. Thanks.